These packages combine South Africa's best safari destination with its best travel options. The Greater Kruger National Park is, without a doubt, the most sought-after safari destination in South Africa. The park’s great size, coupled with its unparalleled biodiversity and a wealth of accommodation options to suit all manner of budgets, makes it the obvious choice. With an abundance of wildlife and substantial numbers of the Big Five, game viewing in this area is exceptionally rewarding. The statistics pretty much speak for themselves. Around two million hectares in extent, boasting 147 different species of mammals and more than 500 recorded bird species, the Kruger Park is your ideal one-stop safari choice. In addition to the immense stretch of wilderness itself, a series of exclusive private game reserves stretch along its unfenced western border. Below, we offer recommendations on the finest Kruger Park safari packages that include the best of both worlds. This is the quintessential, traditional Kruger Park safari experience – the way most local and many international nature enthusiasts have been enjoying the wild spoils of the park for decades. Over the duration of a week, you’ll explore three distinct regions of this sprawling wilderness – typically northern, central and southern – each with its own varied vegetation and unique geographical features. A comprehensive introduction to the park is ensured. Accommodation is enjoyed in three of the park’s standard rest camps – essentially small villages equipped with facilities like casual dining restaurants, swimming pools and ‘park shops’ where basic groceries, toiletries and curios can be purchased. Each camp has its own unique feel and wild setting. The camps included in this Kruger Park safari package are Letaba (known for its elephant museum, resident bushbucks and striking perch overlooking the perennial Letaba River), Satara (‘the cat camp’, set on a flat sprawl of savanna supporting a wealth of plains game) and Lower Sabie (one of the most beautiful and popular camps, overlooking a lush dammed up section of the Sabie River). As this is a privately guided overland safari, your ‘game drives’ will be conducted in a closed, air-conditioned vehicle by your personal African Sky guide. The benefit? You can venture out into the park at your behest – invaluable flexibility. The nature of the vehicle also means that you can continue game viewing during the hotter parts of the day. Your dedicated guide will color your sightings with their extensive knowledge of the wildlife, vegetation and history of the Kruger National Park. Despite the existence of many fine, upscale lodges across South Africa’s prime wilderness areas, to most first-time visitors, the Sabi Sand Private Game Reserve remains at the forefront of the country’s luxury safari brand. Not only does this distinguished 65 000-hectare reserve share an unfenced border with the Greater Kruger National Park, it also boasts the highest frequency of leopard sightings in the world. If the significance of this fact fails to pique your interest, know that the leopard is the most elusive member of Africa’s famous Big Five. Sightings are supposed to be rare. Your 7 Day Kruger’s Finest Fly-In Safari combines two of the finest lodges in the reserve, each tucked away in the most wildlife-rich concessions. Mala Mala’s 13 300 hectares is a legendary safari destination, drawing all manner of celebrities and dignitaries to its exclusive wilderness. It is the oldest and largest concession, perfectly sandwiched between the Sabi Sand’s other concessions and the Kruger National Park. The reserve also incorporates a substantial snag of the Sand River, sustaining a wealth of water-loving wildlife. The reserve’s most esteemed lodge – Rattray’s on Mala Mala – is included in your Kruger Park safari package. Rattray’s hosts eight luxurious 128m2 suites or ‘khayas’, each fitted with every creature comfort imaginable. The bathrooms evoke an old-world elegance with ball-and-claw tubs and roomy double showers. An additional outdoor shower is available for guests with a taste for adventure. Outside, you’ll find your own private plunge pool surrounded by an expansive veranda, enriched with superb views across the river. With each open-air game drive vehicle limited to four guests, you’ll find the experience to be exceptionally exclusive and immersive. Mala Mala boasts the most qualified rangers in the business, with individuals often endowed with university degrees in specialist fields like zoology, ornithology and entomology. 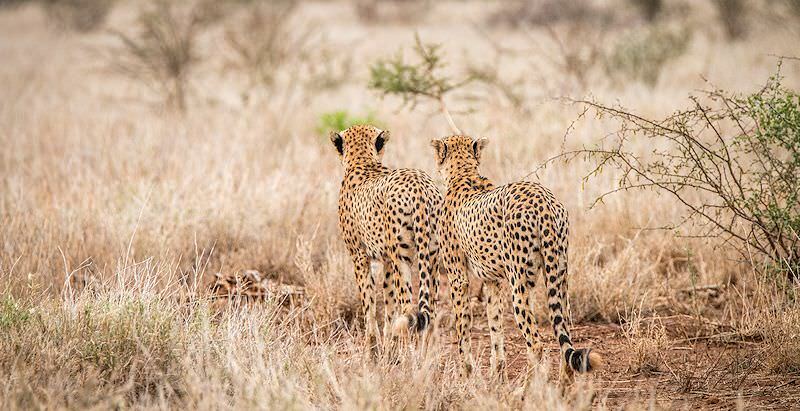 A maximum of three vehicles are limited to each sighting, ensuring intimate game viewing. At Mala Mala, multiple sightings of the Big Five are the norm rather than the exception. 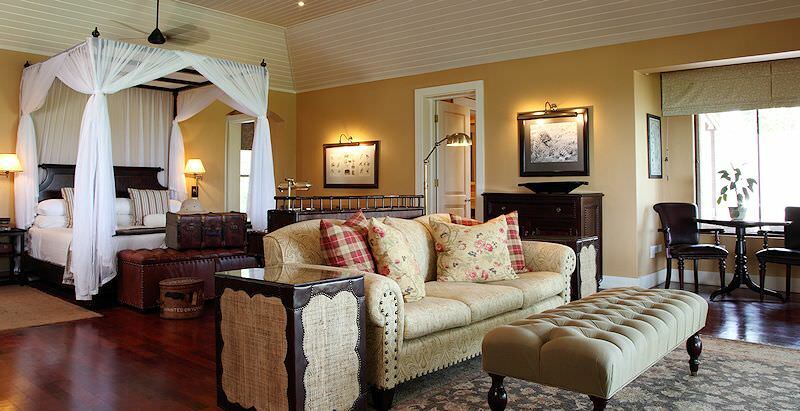 Following your sumptuous stay at Mala Mala, you will be transferred south to Lion Sands Ivory Lodge. The Lion Sands concession is one of only two concessions with direct access to the Greater Kruger’s prolific Sabie River, and enjoys the lengthiest stretch of the riverfront by far. Ivory Lodge is the MORE collection’s most distinguished property, hosting 9 ultra-luxurious villas graced with spectacular river views. In addition to your generously-sized private pool, your villa is also fitted with a sizable separate lounge area (fireplace!) and an additional outdoor shower in an indigenous garden. The cherry on the cake is your own personalized butler service for the duration of your stay. Each property included offers a highly inclusive visit, from all your meals and selected beverages to safari activities and even laundry services. Additional costs apply for premium brand alcohol, spa treatments and curio purchases. For absolute convenience and maximum time spent on safari, this is a fly-in package, meaning that return 50-minute flights are included from OR Tambo International in Johannesburg. All you have to do is show up, relax and relish the thrill of the finest safari experience imaginable. 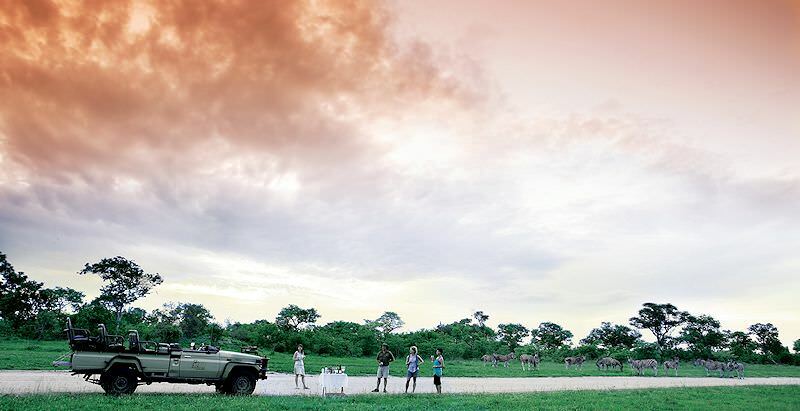 This Kruger Park safari package combines the best of both worlds – an authentic overland Kruger Park safari experience and a plush four-star stay at a private lodge in the adjacent Sabi Sand Private Game Reserve. The adventure starts in Johannesburg, traveling through the Mpumalanga Highlands before the escarpment gives way to the storied wilderness of the lowveld. You’ll enter the park at Paul Kruger Gate – only a short distance from your accommodation for the next two nights, Skukuza Rest Camp. Skukuza is the largest and most established of the park’s rest camps, hosting multiple dining venues, a well-stocked park shop and an educational museum. The camp’s position overlooking the Sabie River is its greatest attraction, however. Your game drives will be conducted in a closed air-conditioned vehicle by your African Sky guide, ensuring great flexibility and as much time spent on the road as you’d like. 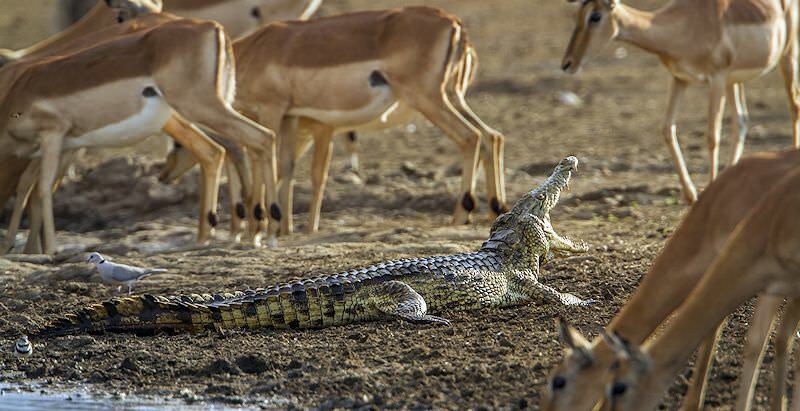 The riverside route between Skukuza and Lower Sabie is legendary for its sightings, as multitudes of animals flock to the Sabie for sustenance. After two nights and three days of exploring prime Kruger territory, you’ll head outside of the park and into the highly sought-after Sabi Sand Private Game Reserve for the private lodge leg of your safari. Your African Sky guide will entrust you to the care of the gregarious staff at Arathusa Safari Lodge, where you will spend the next two nights cocooned in comfort. Arathusa overlooks a large waterhole that is home to a pod of resident hippos, ensuring rewarding game viewing opportunities without even leaving the lodge. There are nine water-facing suites (popular for their views of the waterhole, naturally) and four bush-facing suites (no water views, but their more remote locations and the added luxury of a private plunge pool are great compensation). During your time at Arathusa, you will enjoy two game drives daily in open-air safari vehicles during periods of peak animal activity, i.e. the early morning and late afternoon. In between, you can opt to venture out on foot in the presence of an armed ranger (a truly rewarding and educational experience, with the potential to encounter wildlife) or unwind in the safari spa. Your wild journey ends with a transfer to Hoedspruit Airport and a short flight back to Johannesburg. Three nights and four days is the minimum recommended duration for a safari in one location. It ensures enough time for you to explore and tick memorable sightings off your list, but it’s also short enough that you do not bore of traversing the same area for too long. These factors – along with fantastic value for money – make our 4 Day Kruger Park Safari an appealing choice. This privately guided overland safari departs from and returns to Johannesburg. En route, your dedicated African Sky guide will highlight features of this scenic route, before entering the park at Paul Kruger Gate. Your accommodation at Skukuza Rest Camp may not be luxurious, but the units are quite comfortable and serviced on a daily basis. At the camp, you can dine at the Selati Station Grill House, home to the Selati Express, the original ‘game drive’ train that ferried visitors through the park in the 1920’s. Additional in-camp attractions include two swimming pools, a trundling pathway with comfortable benches along the camp’s perimeter and the Stevenson-Hamilton Memorial Library (well worth a visit). Beyond the camp, you can plant yourself at Lake Panic’s prolific bird hide, or even book nine holes at the nearby Skukuza Golf Course. The main activity, however, will be your game drives, conducted by your knowledgeable African Sky guide at times of your choosing. The area immediately surrounding Skukuza prospers with wildlife. The Sabie River, one of the park’s perennial life forces, nourishes the region and invites floats of crocodiles and hippo pods to take up residence in its dependable waters. Sightings of the Big Five are common around here, along with the far rarer African wild dog. You are sure to find this short-but-sweet safari package most rewarding. As with the previous safari package, the goal here is to ensure an ideal duration for you to make the most of your Kruger Park safari experience without days stretching into tedium. This package, however, is enhanced by the inclusion of lavish full board accommodation in the Sabi Sand Private Game Reserve – the premier destination for a luxury safari in South Africa. The safari lodge of choice is Lion Sands River Lodge, named for its sought-after location on the banks of the Sabie River. A total of 18 rooms are available, ranging from the entry-level Luxury Rooms to Superior Luxury Rooms and River Suites. While Lion Sands River Lodge may be one of the larger five-star lodges, your accommodations will nevertheless feel intimate and immersed in the wild. Your days are devoted to safari activities in this world-renowned wilderness. Game drives are conducted in the early morning and in the late afternoon, during periods of increased animal activity. Throughout the day, you can unwind in your sumptuous lodgings, spoil yourself with a spa treatment, take a dip in the lodge’s pool or even tackle the Sabi Sand on foot. You’ll be accompanied by an armed ranger, who will also highlight interesting facts about the vegetation and traces left behind by wildlife. If you’re lucky, you might even encounter animals during your walk. This package is conveniently inclusive – from your return flights from Johannesburg to refreshing beverages during your game drives. 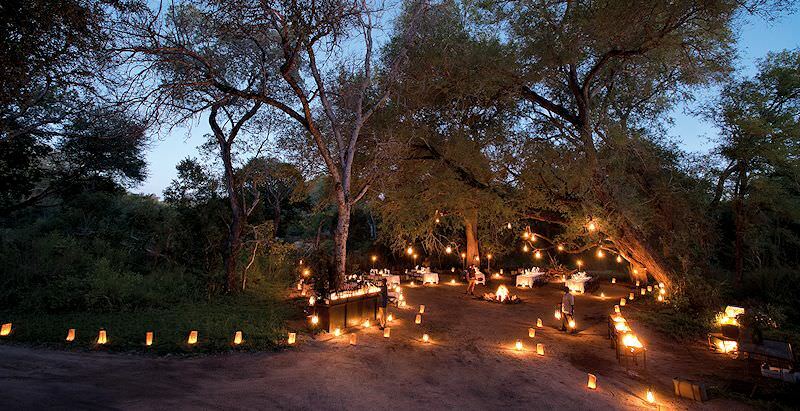 Guests are often treated to ‘surprise’ extras like bush dinners and picnics. Exclusions are limited to premium liquors and wines, laundry, spa treatments and curio purchases. NOTE: Lion Sands River Lodge was severely damaged by a fire in June 2017. The refurbished lodge will reopen in May 2018.